The call is open for ambitious female entrepreneurs who are looking to scale their businesses to join the latest cycle of Going for Growth, the award-winning business development programme which is the brainchild of Paula Fitzsimons of Fitzsimons Consulting. 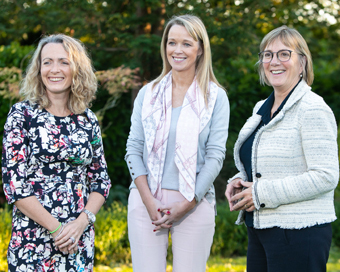 Going for Growth is a six-month part-time programme, sponsored by Enterprise Ireland and KPMG, which assists ambitious female entrepreneurs to achieve their growth aspirations. The programme is seeking applications from female entrepreneurs – across all sectors – who are strongly focussed on growth. Ideally, businesses should be well established and trading for at least two years. Sixty places will be available for this 11th cycle of Going for Growth, which will run from January to June 2019 and the deadline for applications is Wednesday, November, 28th. There is no charge for those selected. Anyone interested is encouraged to register their interest in receiving an application form at goingforgrowth.com. One past participant is Mary O’Brien, CEO and co-founder of online medical service videoDoc, which has gone from no employees when she joined Going for Growth to 32 staff in Dublin and London, with plans to double this in the next six to 12 months. Some of videoDoc’s clients include the NHS, a premiership football club, hospitals, health insurance providers and employee benefit providers in the UK and Ireland. “Since starting with Going for Growth, we have raised €6m with plans to close another similar funding round early next year. We are in 250 pharmacies in Ireland, England and Scotland, offering in-store doctor services and have also launched therapy and physiotherapy online services,” said Mary O’Brien. Most owner/managers agree that growing a business can be a very isolating experience and it can be difficult to find someone on your wavelength who understands the issues involved. The Going for Growth round table initiative is designed to address these challenges and those selected will join interactive round table sessions led by Lead Entrepreneurs. The Lead Entrepreneurs are successful business women with personal experience of growing a business and urge others to apply for Going for Growth. These high-profile business leaders volunteer their time to encourage participants to set and achieve personalised goals and milestones to address the opportunities and challenges they face in driving growth in their businesses. Some of this year’s Lead Entrepreneurs include: Louise Phelan, Paypal, Fidelma McGuirk, Payslip and Marian O’Gorman of The Kilkenny Group. Previous participants are ambassadors of the benefits for Going for Growth and several now volunteer their time as Lead Entrepreneurs, including: Marissa Carter, founder of Carter Beauty, Nikki Evans, founder of PerfectCard, and Oonagh O’Hagan, owner of Meagher’s Pharmacy Group. Going for Growth is designed to be action and results-oriented and to go beyond classroom style learning and the usual inputs of professional trainers, consultants and academics. The round tables are based on real experience of what has worked and what hasn’t worked in real life situations. Previous participants report significant progress, with the great majority reporting an increase in confidence, a reduction in psychological isolation and a feeling of being nearer to achieving their growth goals. four first time exporters, increasing to 30 the number of participants with export experience. Julie Sinnamon, CEO Enterprise Ireland, said: “Supporting ambitious business women to start new businesses is a key priority for Enterprise Ireland and in 2017 more than one in three Enterprise Ireland backed start-ups were led by women, an increase from one in ten just five years ago. Having impacted successfully on the number of start-up businesses led by female founders, a key focus for Enterprise Ireland is to increase the number of companies that achieve scale. This is the 11th year of the programme and more than 600 female entrepreneurs have so far taken part in Going for Growth. Check here for more details. Pictured are (l-r) Olivia Lynch, Partner KPMG; Mary O’Brien, CEO videoDoc and Julie Sinnamon, CEO Enterprise Ireland. Bord Bia Builds up for Brexit!